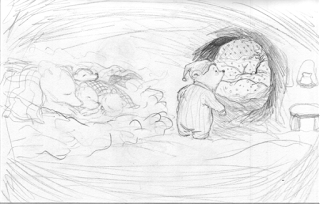 Not too long ago, Birth Stories for Books featured a story about Wind, who is tired and needs a place to rest and another about One Snowy Day. Keeping with the themes of winter and rest, today's post features an interview with author Caroline Nastro about her book THE BEAR WHO COULDN'T SLEEP, illustrated by Vanya Nastanlieva (NorthSouth Books, 2016). 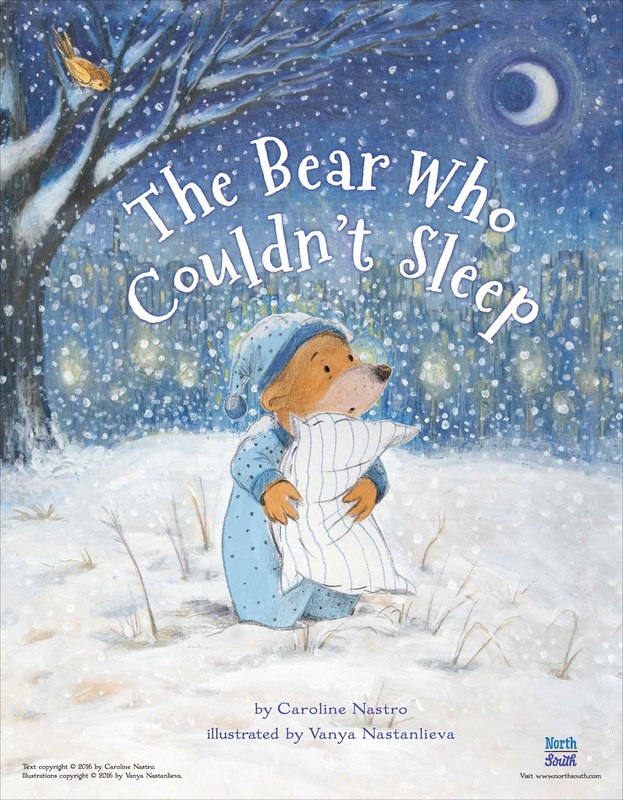 Dawn Prochovnic: Thank you for stopping by to talk with us about your picture book THE BEAR WHO COULDN’T SLEEP, Caroline. It’s my understanding that the birth story for this book is a bit unique in that you met your editor at a writing conference and then contracted together with illustrator, Vanya Nastanlieva, for publication of the book. Can you tell us a little bit more about your experience? Caroline Nastro: I was used to collaborating with artists as a theater director, and I thought it would be interesting to collaborate in a similar way with a picture book illustrator. I read a great book called Illustrating Children’s Books by Martin Salisbury who is a professor in the Children’s Book Illustration program at Cambridge School of the Arts in the UK. So I looked online and saw that the school posted the websites of their recent graduates, and I discovered an illustrator named Anca Sandu, a Romanian-born illustrator living in Portland, Oregon. Anca and I started working together and presenting our projects to publishers. 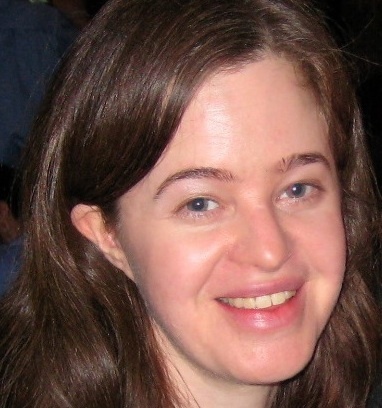 Anca’s work is beautiful; she has written and illustrated several books, and her artwork for one of my manuscripts, Emmeline, was a finalist for the Katherine Patterson Prize. 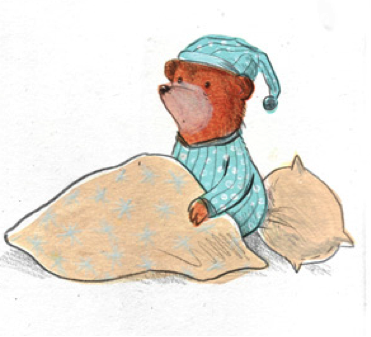 So when I wrote The Bear Who Couldn’t Sleep, I showed it to Anca, and she thought that another friend of hers from Cambridge who was really good at drawing adorable animals would be a great illustrator for that book. So she put me in touch with Vanya, and that is how Vanya and I began working together! Vanya is a Bulgarian illustrator based in Cambridge, UK so it’s been a really interesting, international journey of sorts, all thanks to the internet. A year later I was accepted to the Rutgers University Council on Children’s Literature Conference, and I saw that Beth Terrill from North South would be attending. I really love the books that North South publishes, so I was keeping an eye out for Beth at the conference. And then while walking in the hall during a break at the conference, I overheard someone introduce herself as Beth Terrill from North South and there she was! 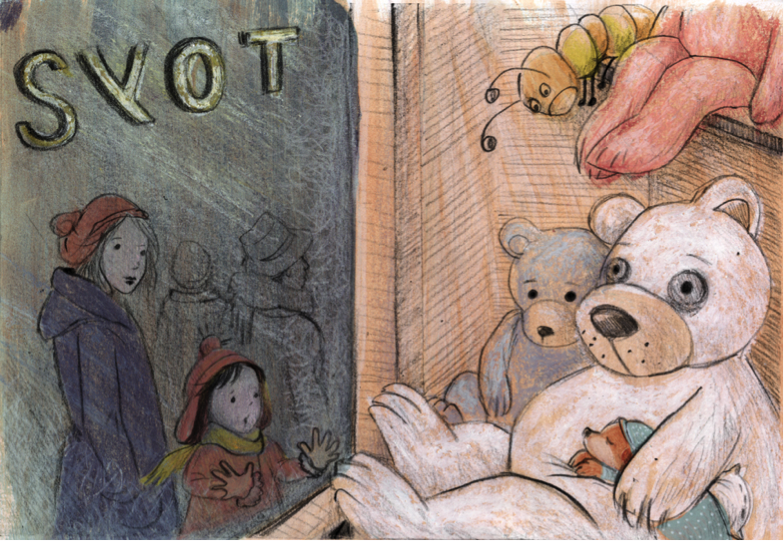 I showed her the Bear story and a few of Vanya’s pencil character sketches and that is how the process started. DP: Those are lovely. I can certainly see why Beth was interested! Pitching a story alongside a collaborator's illustrations is definitely a less typical approach. With that in mind, can you share with us a little bit about the process of working together with Vanya? CN: In terms of how Vanya and I worked together, we did a lot of experimenting and exploring of ideas between the time that I first showed Beth the project at Rutgers and when we started working with the team at North South, which I think was really helpful to the process. When we began working with North South, we continued working in this way, with Vanya and I working together behind the scenes and then presenting sketches and storyboards to Beth and the art team at North South for their input. In a way, I acted as a kind of informal art director—Vanya would send me sketches and ideas before we presented them to North South, and I’d give my input. Since Vanya had never been to New York City, I also did photo research for her—taking pictures of Central Park in the snow and the Dinosaur Hall in the Museum of Natural History, or finding images to capture that old-school, timeless feeling of New York City that we were trying to create, such as the storefronts in the Times Square spread. DP: It's great to hear the back story. 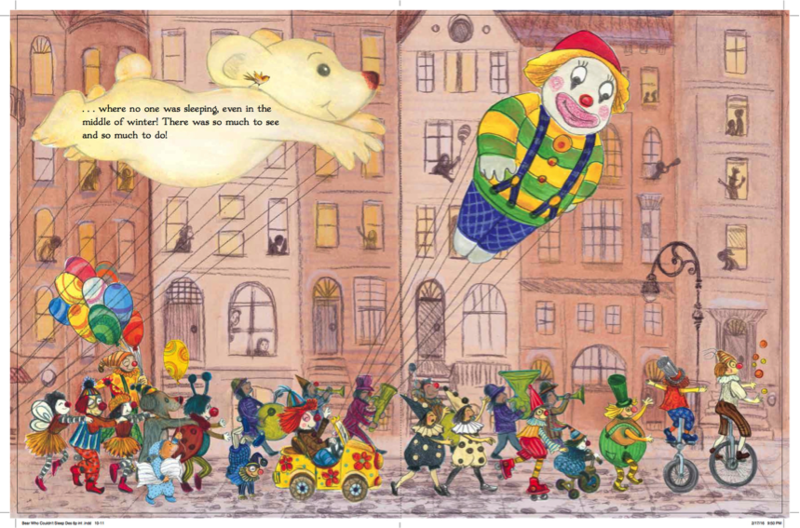 Speaking of which, I’ve read in earlier interviews that you grew up in New York City and the idea for THE BEAR WHO COULDN’T SLEEP came to you when you were walking through Central Park on a snowy day. Can you tell us a little more about how the story idea came to you and how it developed over time? CN: At the time I had been reading some nineteenth century journals written by pioneer women for another project. And it was interesting to see how closely aligned their lives were to the cycle of the seasons. 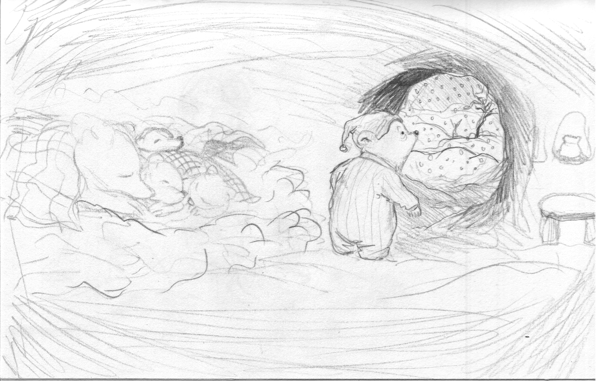 In winter, they wrote about chores such as sewing and fixing tools or making candles, but it was generally a quiet time, a hibernation of sorts. I also had just returned from spending a weekend in a cabin in the woods in northwest Connecticut where there was no electricity. It was really peaceful and quiet in the snow. And so when I was back in New York City and walking home through Central Park in the snow, it really struck me—this dichotomy between the natural world, where the plants and animals were “sleeping,” so to speak, and the world outside the park that was always in motion no matter the time of day or the season. And then I started thinking about an animal character, a bear, who has this same feeling of urgency to always be moving, to get things done—a bear who can’t slow down or tune out the distractions, even when nature demands it. And then this bear learns that having a nice, quiet place to sleep in the winter is not all that bad; in fact, it’s perfect. At heart, I think The Bear Who Couldn’t Sleep is really about that: the importance of stepping back, taking a breath, and seeing that the quality of what you do is often more important than the quantity; or in other words, trying to be “as present” as possible and in tune with your surroundings, something that animals naturally do. DP: Oh, that's beautiful, Caroline. That really puts it all in perspective. Now that we're feeling all cozy, let's shift gears a bit to talk some more about process. What was the process and timeframe between that initial idea and the story that was formulated fully enough to submit to an editor? And, when you compare one of your earliest drafts of this story to the version in the published book, what stands out for you in terms of what is most different? Likewise, is there anything in particular that stands out that was included in your earliest drafts and survived the revision process? 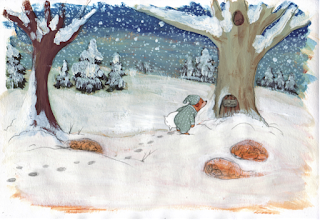 “Once upon a time there was a bear who could not sleep in the winter. While his mother and brothers slept, he lay awake. He counted sheep. He drank some hot milk. But try as he might, he simply could not hibernate! In general, I included a lot more detail in the first versions of the story. 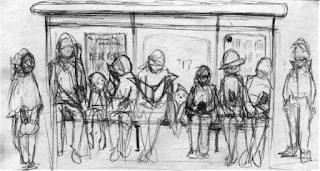 I like to do that: write as many details as I can at first, “overwrite” the story, so to speak, so I can picture the world and the character’s behavior and then I pare it down, bit by bit. Oftentimes, I find that I can still feel the traces of the original story even though the words are no longer there, if that makes sense. It was about one or two drafts later that the story took on a shape that was very similar to the version that I showed Beth at Rutgers. 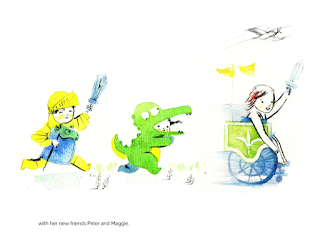 And then after the story was acquired by North South, Vanya and I made other changes. That was what was especially great about collaborating directly with Vanya; we could tweak the story in response to each other’s ideas. 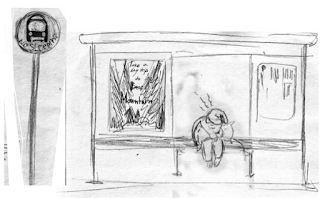 One example is the scene at the bus stop. That scene wasn’t in the text at all. 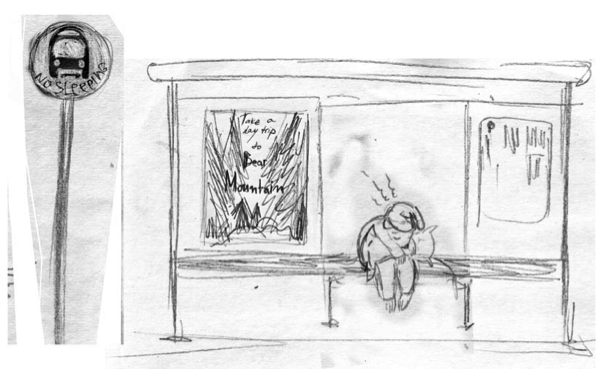 But Vanya drew a sketch of Bear falling asleep at a bus stop, and then waking up amidst all of the people waiting for the bus. So I wrote that scene in. In another instance, Vanya and I were exploring different possibilities for the moment when Bear first arrives in the city. We wanted to show that there were a lot of exciting things going on in the city, but we also didn’t want the city to feel too overwhelming. Beth, who is an amazing editor, came up with the Thanksgiving Day Parade idea, which was perfect. 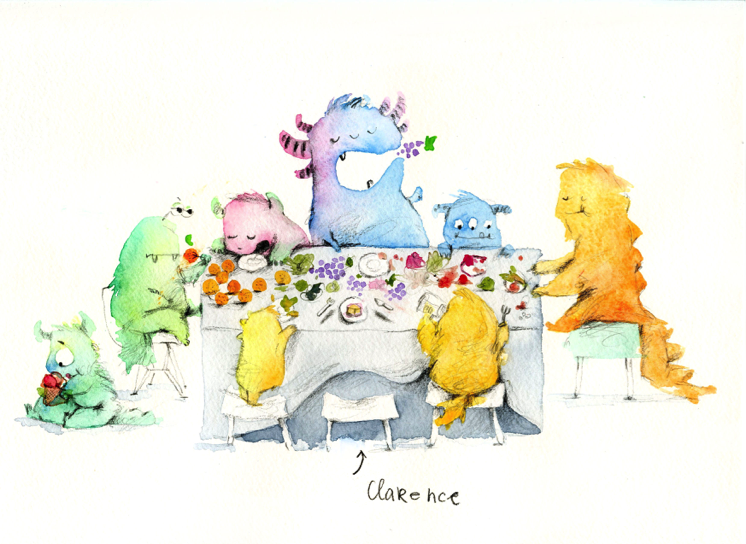 And Vanya really outdid herself with that illustration. I’m not sure any of these changes would have happened if not for the fact that Beth, Vanya, and I were all working so closely together. I’ve gotten a lot of feedback since about how well the illustrations and text work together, and I think our close collaboration had a lot to do with that. As you reflect on the journey from idea to published book, is there any one moment along the way that you credit with opening the door for this particular story to find its way to publication? 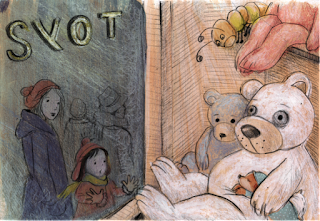 CN: I think the one tangible thing that really opened up the door to publication of The Bear Who Couldn’t Sleep was that meeting with Beth Terrill, North South’s editor, at the Rutgers Conference. But what’s also interesting is that before that meeting occurred, I had had a couple of life-changing experiences, including a serious car accident, that had led me to reevaluate my life and look at my world in a completely different light. I think that is a big part of why I started writing picture books in the first place. And I wonder if that “coincidence” with Beth would have happened without those life-changing experiences, i.e. that they went hand in hand; like static electricity, they kind of “attracted” each other. For me, it’s a reassuring thought to think that no matter what is happening on a professional level, we can still be creating opportunities, moments of growth, on a personal level, which may lead to other doors opening…. DP: That's a really important reminder, Caroline. Thank you for that. Speaking of your professional life, I understand that in addition to being a picture book author, you are an award-winning playwright, screenwriter, and theatre director (congratulations!). What advice would you give those of us who do not share your background in theatre/film that might be helpful? CN: I think my experience in theater really helped me focus on the visual elements of the story while I was writing it. 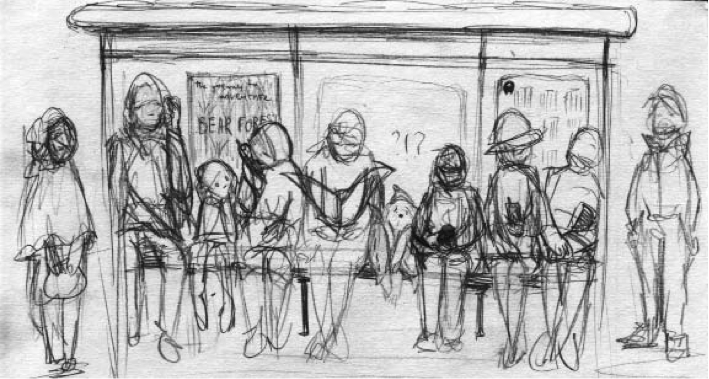 Even though I knew I wouldn’t be illustrating the story myself, I was always thinking about what the scenes might look like. As I was writing the story, I would picture Bear, imagining what he might do next or how he might react to a situation as if he were an actor in a film or a play. And then I would write the text to accompany that picture. I thought of it as a kind of balancing act between what could be said better with words and what could be said better visually. 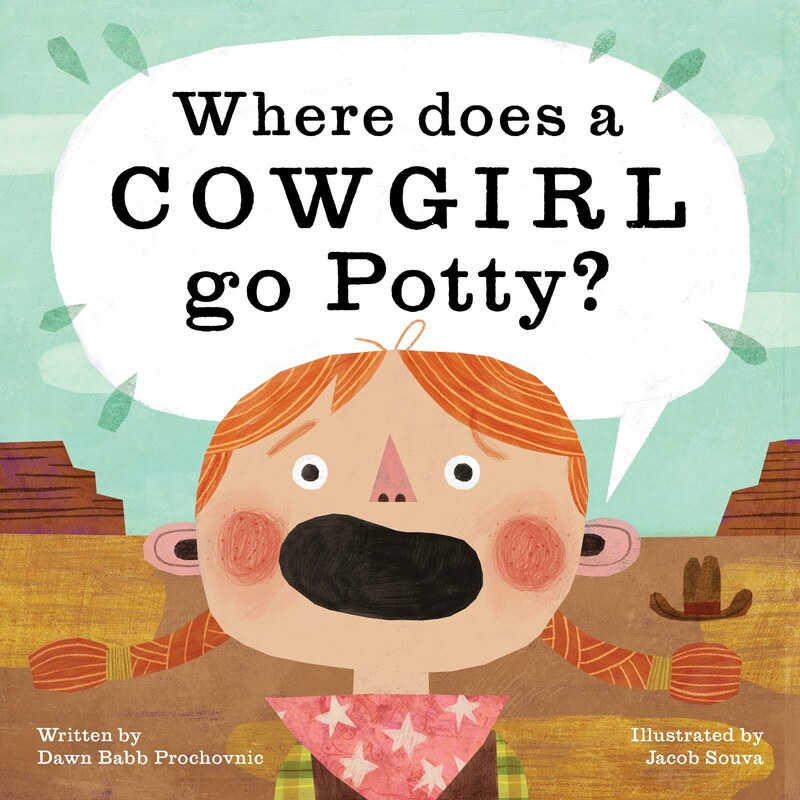 That’s something you do in theater all the time, and I think it’s really helpful to use that same kind of approach when writing a picture book. You start to see places where the text isn’t really needed, where you can let the pictures tell the story. Conversely, it also helps you to see which text is really needed, to see what words the pictures really cannot do without. I actually think that’s what I love most about writing picture books—finding this balance between the illustrations and the words. So to sum up, I would say to other picture book writers who may not have this kind of theater background: Imagine a world. Think about what you see in that world, and then write text that complements (and doesn’t overshadow) that world. Because when you give great illustrators a text that has room to breathe, they will fill that space with wonderfully inventive visuals. DP: Yes! That is so very true. Well, before we close, is there something you wish someone would ask you about THE BEAR WHO COULDN’T SLEEP and/or your path to publication that you haven’t had the opportunity to share yet? CN: I would like to say how wonderful it is to be writing books for children. I’ve been reading the great Mo Willems’ Let’s Go for A Drive lately with my toddler. 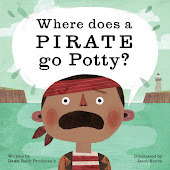 And I’ve been thinking about how amazing it is that I am part of a profession where there are characters like Piggie and Gerald who want to go on a drive, and when they realize that they need a car which they don’t have, they invent a pirate ship! It’s a world without limits, where anything can happen—a place filled with hope, imagination, enthusiasm and joy. And I think anyone who works with children or for children, who tries to look at the world through their eyes, can’t help but feel that joy and enthusiasm. It’s infectious. And it’s such a gift. No cynics allowed…. DP: I could not agree more, and I could not have said this better myself. We are so lucky to be working in this hopeful and joyful field. One more question before we wrap up: Do you have anything you’d like to add about what you’re currently working on? And lately I’ve been re-working the text for a story called Outside Amelia’s Window about a girl in a wheelchair who is inspired to “soar” by the migrating birds outside her window. I’ve been working on this manuscript at the Bank Street Writer’s Lab, a critique group that I joined this past year. It’s been wonderful receiving feedback from the talented and experienced writers who are members of that group. DP: Oh, wow, Caroline. These images are full of energy and inspiration! (I'll look forward to crossing paths with Anca someday--we live in the same town, after all!) 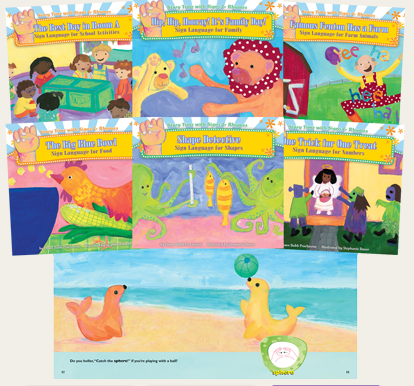 And, speaking of inspiration, thank you for sharing your inspiring birth story for THE BEAR WHO COULDN’T SLEEP, available everywhere books are borrowed or sold. I've learned so much from you, Caroline, and I know our readers have, too. Caroline Nastro is an award-winning playwright, screenwriter, and theater director. Her first picture book, The Bear Who Couldn’t Sleep, was published by North South Books in October 2016. 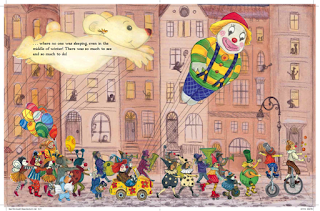 The Spanish edition, El osito que no se podía dormir, (translated by Mercedes Herrero) was recently named one of the Best Children's Picture Books of the Year in Spanish by the Bank Street Children’s Book Committee. Caroline currently lives in New York City.